Updates & Events from UpRight Law. Built in Chicago has released its 2015 list of the Top 100 Digital Companies, and we’re on it! Chicago is fertile ground for innovators. Today, there are more than 3,200 digital companies in the Chicago metropolitan area, employing more than 54,000 people. 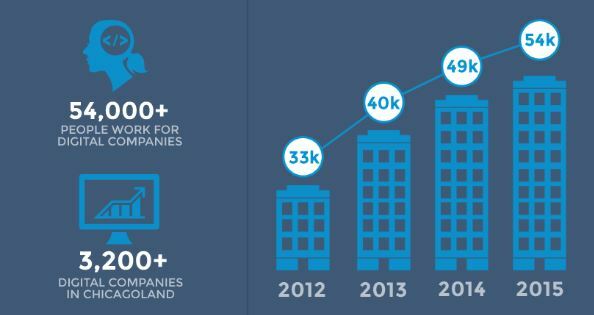 Those numbers are growing fast, too: 21,000 digital jobs have been added since 2012–more than 100 of them in our offices. That’s a great environment to be working and innovating in, and we’re especially happy to be ranked among some excellent Chicago companies—start-ups and established companies alike. Some of the others on the list include Groupon, GrubHub, CareerBuilder, PeaPod, and Orbitz. We’re still growing and expanding our services, so we’re looking forward to moving up that list next year!